Q: Within the specialist area of CBRN protection we don’t hear an awful lot about CBRN decontamination so is it particularly important? A: You are right in that decontamination is probably one of the least known pillars of CBRN protection and indeed it does not receive the importance that it deserves. I can safely say that the human brain is inquisitive and loves to find things out, so perhaps we should not be surprised that substantial budgets are often allocated to detection, while decontamination receives less attention. I like to compare it to washing up after supper. It’s never the most popular task, but crucially decontamination means that something has actually happened and you need to do something about it fast or accept the constraints that will be imposed by doing nothing. In many instances the latter option will be wholly unacceptable, particularly in urban environments. If there is an incident there is normally substantial focus on medical counter measures and the emergency response. There has, however, been several high profile instances when, notwithstanding prior warning and indicators, decontamination and the prerequisite training has been unavailable or late in arrival and with dire consequences; death and injury of the innocent including responders, dislocation of norms and an exponential increase in the problem. Q: We appear to be subject to increased instances of new diseases that occupy headlines from time to time. Are these new diseases the same as a deliberate biological event? A: That’s an interesting question that could occupy an entire chapter! Simply put, biological release can present a significant conundrum as many biological warfare agents exist naturally, anthrax being a well known example. Weaponising such agents requires a measure of scientific and technical expertise and generally speaking the probability of such use has been considered low, with the principal threat of deliberate release coming from the dysfunctional or aggrieved, albeit terrorist and dark web chatter demonstrates there is no lack of intent and the threat state could change very quickly. For instance, on 3rd May 2016, part of a Kenyan Jihadist Cell comprising hospital medics with links to ISIL was apprehended in what the authorities described as a “large scale” anthrax plot. A significant concern is the networking of information between affiliate organisations that are known to be present in the Levant, Middle East, Africa, Central and South East Asia, not to mention so called ‘home grown’ cells or those returning home from Syria and Iraq. That said, one of the greatest challenges arises from diseases which continue to emerge and mutate. At the moment, the Zika virus is in the headlines. Spread by mosquitos the virus can cause microcephaly and other foetal brain defects during pregnancy. Before that it was a new strain of Ebola that grabbed world headlines, and the outbreak of Middle East Respiratory Syndrome (MERS) that affected 27 countries. Other viruses like Avian Flu, Swine Fever, Severe Acute Respiratory Syndrome (SARS) and Foot and Mouth disease have all caused particular challenges since the turn of the century. The speed, reach and super efficiency of air, road and rail transport systems can also place populations at risk. Note that of the 27 countries affected by MERS, 17 of them were travel associated cases. Outbreaks can rapidly overcome health care systems, especially in cities, townships and villages where people live in close proximity. In several instances, this has led to the Military being deployed to assist in mitigating outbreaks. Infection control, the prevention of contamination, getting your retaliation in first, if you like, also features high on health agendas, while there is increasing concern about Anti-Microbial Resistance, putting an even greater onus on prevention. Q: What about Chemical and Radiological hazards? These too have their own particular threats and challenges? A: Of course biological has not been the only challenge to grab the headlines. There have been very high profile examples of accidental and deliberate chemical release. The Tokyo Underground attack using sarin in 1995, the release of anthrax into the US mail system post 9/11 and the barbaric use of sarin in Syria against the innocent in the early hours of 21st August 2013 are prominent examples of release; all of them in urban settings. ISIL’s improvisation of chemical weapons continually occupies the headlines; most recently the Organisation for the Prohibition of Chemical Weapons (OPCW) has found evidence of the use of Sulphur Mustard in Iraq and Syria. On 4th May 2016 the Head of the OPCW, Mr. Ahmet Uzumcu said “It proves that they have the technology, know-how and also access to the materials which might be used for the production of chemical weapons”. ISIL may well be drawing on expertise made up of foreign experts and Iraqi scientists who worked under Saddam Hussein’s weapons programmes or who have become radicalised, compensated financially or coerced. For radiological, both Chernobyl and Fukushima will continue to resonate for decades. The release of Plutonium 210 in the Litvenyenko murder in London in 2006 offers another form of radiological contamination, as does the much vaunted Dirty Bomb scenario, or worse, an improvised nuclear weapon. Radiological decontamination presents its own challenges, specifically the removal of radioactive waste in the most efficient [preferably ‘non aqueous’] manner possible. 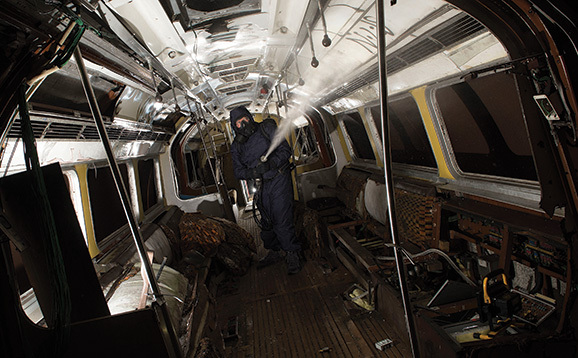 Q: Concepts and doctrine drives equipment solutions, so can you give us some insight into the thought process that brings Scott Safety’s solution into a fairly crowded decontamination market? A: They say that if you have to think while conducting decontamination, it is too difficult! This is because decontamination can present a significant physical and psychological burden on the individual. As a result, huge importance was placed on simplicity. We were also mindful that in many scenarios, particularly in populated areas, urban terrain can be very complex: high rise, subway systems, centres of governance, airports, hospitals and swathes of interior space where a CBRN incident will heap on more complexity; while interiors could equally draw in transportation such as civil and military aircraft interiors, underground and surface rail carriages and so on. Deployability and reach were therefore considered very important so we were looking at a manportable solution initially, with the potential for remote and robotic delivery. A further consideration was deployability to support, for example an external civil defence or military deployment to deliver humanitarian assistance and disaster relief, for instance ensuring infection control or decontamination of field hospitals or decontamination shower tents for ambulatory and non-ambulatory personnel. We were also very mindful of the logistic burden. Decontamination is synonymous with water, of applying aqueous chemistries, of foams and hosing down, but these are more often wholly unsuitable for decontamination or disinfection of interiors, and particularly for the decontamination of sensitive and complex surfaces, and once again the removal of radiological particulate. Finally, we wanted multi-functionality for multiple scenarios right across the CBRN spectrum. Getting the name of our equipment solution right was also important. Initially, we called it the First Response System, where it certainly has excellent utility, but then the equipment also has huge utility in a longer term remediation role once immediate danger has passed. Finally we settled on the Light Decontamination System or ‘LDS’. The Remote Decontamination System ‘RDS’ enables decontamination and disinfection with tripod and 3600 nozzle. The system is operated unmanned by remote control from outside the hazard area. The tripod assembly folds into a small haversack. Q: How would you describe the LDS’ general characteristics? 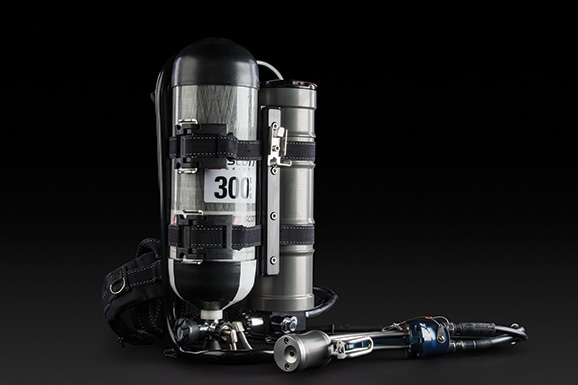 A: First, the LDS has four principal parts (1) a special decontaminable backpack harness and frame that also enables the system to be set down in an upright position (2) a 300 bar air cylinder (3) a 4 litre chemistry cylinder and (4) the all-important linear nozzle. The system supports delivery of up to 4 litres of chemistry in a single application, powered by the 300 bar air cylinder that generates micro-droplets in the 1 – 5 micron range. In layman’s terms one micron is approximately 1/100th the size of a human hair. This superfine plume of mist has gas-like behaviour and can rapidly and simultaneously decontaminate Line of Sight (LOS), Non Line of Sight (NLOS) surfaces and airborne particulate. With regard to measurement, using just one litre of chemistry, the LDS can decontaminate a room of 40m3. 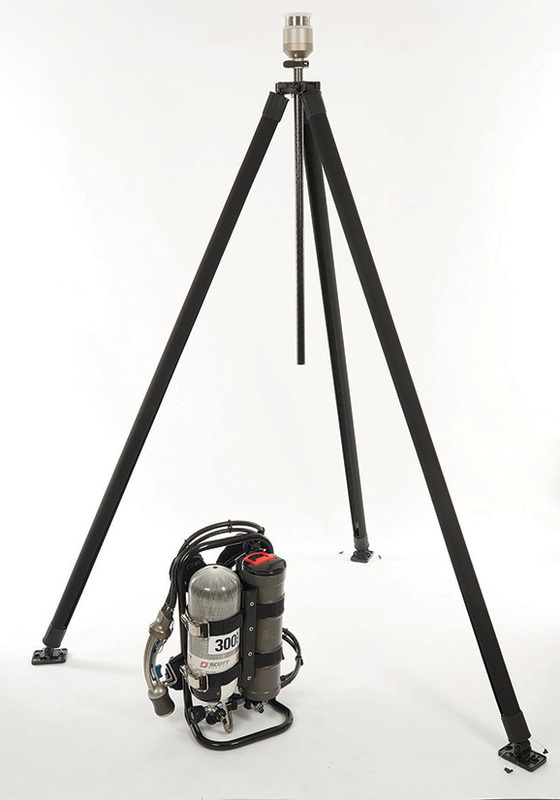 As an accessory, we offer the Remote Decontamination System (RDS) which sees the LDS set down in the upright position to feed a remote tripod mounted 3600 nozzle that delivers an area spray rather than linear plume. The system is initiated by remote control from outside the hazardous area. Deployability has been a feature, in that the lightweight but robust tripod assembly folds down and can be hand carried in a small haversack. Q: You mentioned in conversation that there were competitors in the market so what is it that marks you apart? A: Simply put, the innovative technology in the nozzle and multi-functionality offer deliver a host of superior benefits. The linear nozzle delivers a turbulent penetrative superfine mist at approximately 14 Trillion droplets a second. Aspiration produces a plume out to 25 – 30 metres. The highly turbulent plume ensures that active chemistry penetrates every Non Line of Sight nook and cranny; moreover the turbulence ensures a continuous refresh of chemistry on the contaminated surface. There is no heating or thermal damage to chemistry, as you are likely to find in a fogger; moreover the air powered LDS does not rely on fuel, oil, electricity or moving parts. It’s just a simple matter of mixing air and liquid; of turning on the air, pulling the safety pin and then squeezing and releasing the trigger, as required. The overall effect sees an extremely rapid fill of interiors, less liquid consumption, less logistics, less wetting and therefore less waste and no effect on electronics. The LDS can deliver any chemistry or powder as well chemistries of various viscosities. This makes it suitable for dispensing atomised glue-like polymers which can knock down and tie down radiological particulate, aerosolized white powder or respirable silica and other harmful dust. In many scenarios it will make sense to spray merely as a security measure, making the air atmosphere considerably safer. While the LDS can atomise any liquid, it can also extinguish Class A and B fires using atomised water for instantaneous thermal reduction and oxygen displacement, and finally, it can deliver odour abatement chemistries to overcome smoke odour or foul smells. We were surprised to find that the latter is a whole industry in itself. Q: How do you go about verifying the efficacy of the LDS? A: From the outset we were very clear that we had to invest significantly in wholly independent verification of the LDS’ performance. Thus biological verification was conducted over a six week period at the United Kingdom Government’s Health and Safety Laboratory in Buxton, Derbyshire. For example, sporicidal efficacy was demonstrated in their Containment Level 3 Laboratory against live anthrax achieving an 8 log Non Line of Sight reduction in 5 minutes, well within the NATO 60 minute norm. We also tested against various viruses including MRSA (99.99999% reduction) and an Ebola simulant (100% reduction), in each case achieving a highly efficacious peak microbial reduction within 15 minutes; again on Non Line of Sight surfaces. For chemical warfare agent verification further significant investment was made in tests at the facilities of the Czech Republic National CBRN Institute. Again the technology was proven to deliver super-efficient Non Line of Sight decontamination of blister agent Sulphur Mustard and nerve agents Soman and VX. Our testing did not just rely on laboratory in vitro testing; the actual LDS itself was used to dispense the atomised chemistry onto complex surfaces within interior chambers, replicating actual operational use. Q: Although you have only just launched the Light Decontamination System, what about the future? Do you have any plans for further development? A: Yes, indeed. 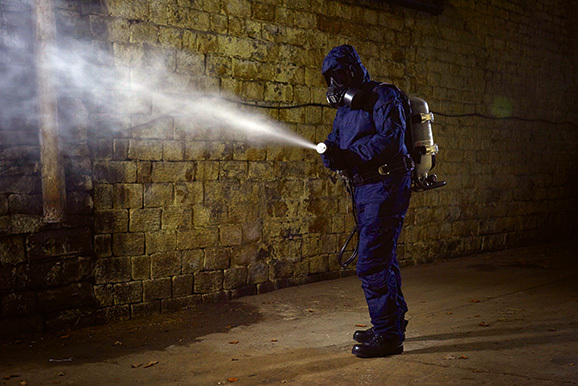 We are planning independent verification for the decontamination of personnel wearing their operator and responder protective equipment; in effect decontamination of protective clothing and equipment without the need of expensive machinery, heating, dunking or scrubbing. We are also planning to bring a much larger wide area system to market. This will be enable Line of Sight, Non Line of Sight and airborne decontamination of very large interiors. There are a substantial number of examples, from Government buildings and palaces to underground shelters or subway systems, from very large aircraft to ships holds and nuclear decommissioning. After the initial emergency, you may well be faced with a substantial environmental clean-up requirement to restore normality and public confidence. We could well partner with a robotics company, if that is what the customer requires. Scott Safety places huge emphasis on innovation and in this particular instance, we can see applications right across government departments: Defence, Civil Defence and Security, Health, Agriculture, the Environment and Humanitarian and Disaster Relief. For the moment, we offer a simple operator friendly and highly effective decontamination and disinfection system that has huge functionality across the CBRN spectrum. Dr David Crouch is Associate Director Global Product Management (Military & Civil Defence) at Scott Safety, Vice Chairman and Chairman elect of CBRN-UK.